It’s the Friday Five with: Cynthia, Mar, and Courtney today! Today’s topic is Free Friday, so I figured that I would ponder 5 things that I would like to do while I’m in Paris next week. What a perfect time to have free Friday! 1. Eiffel Tower-Obviously I have to see and at least go part way up the Eiffel Tower! 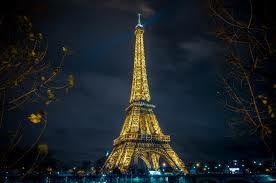 It’s such an iconic symbol of Paris and I’m sure that it won’t disappoint. 2. Pastry Shops-I also must visit lots of pastry shops, which I’m certain there won’t be a shortage of. I don’t think that I will need to eat again for a month after I return but I consider it research for my job. 3. Arc de Triomphe- I think this is right near where we are staying so it should be easy enough to get to. I hear the view from the top is amazing! 4. River Seine- I’m hoping to run along the river in the morning. I think watching the sunrise there would be so beautiful, but since I’ll be on vacation maybe I will actually sleep in past 4am. We’ll see. 5. Window shopping- I know they have some incredible purses, clothing, etc. over there that cost a small fortune, but it doesn’t hurt to look. There are so many things to do in Paris! These were just the first things that came to mind. While it’ll be hard to leave Haylie behind, I’m sure this trip will be amazing and a good bonding experience for my husband and I. Do you have any recommendations on things to see/do while in Paris? 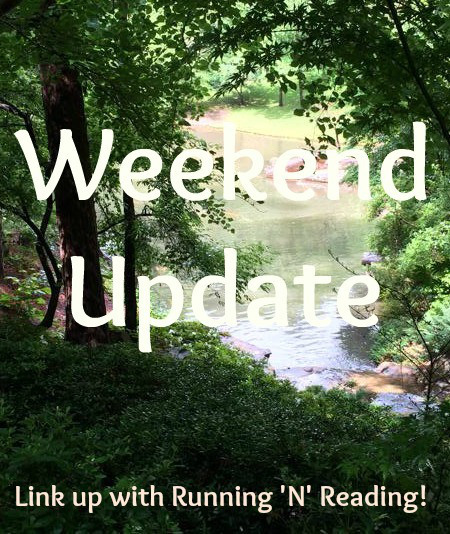 It’s Monday, so I’m linking up with Tara for another edition of Weekend Update! This was my super long, four-day weekend! It’s not quite as great as it sounds due to me having a cold/flu the entire time but hey, I would much rather be sick now than next week while I’m in Paris! I got up for work for work and discovered that I was ill. My throat hurt so bad that it was difficult to talk. I sucked it up and went to work, because that’s what you do when you work in the food service industry. It makes perfect sense, I know. Later, I got in my 5 mile run at Fleet Feet. We did a slightly faster pace than we have been doing and I didn’t feel horrible despite being sick. Maybe that speed work is already making a difference? This was a rest day for me anyway so I took that pretty seriously. I had a doctor’s appointment in the morning and other than that didn’t do much for the remainder of the day. I got up at 4:30 to give my dog his meds and decided to stay up. I enjoyed some coffee and read blogs until the sun came up so that I could go for a run. Considering that I’ve never really been a morning person, it continues to amaze me how I voluntarily get up so early to go for a run. I didn’t exactly have a goal in mind for this run since I was sick, so I just went with how I felt. 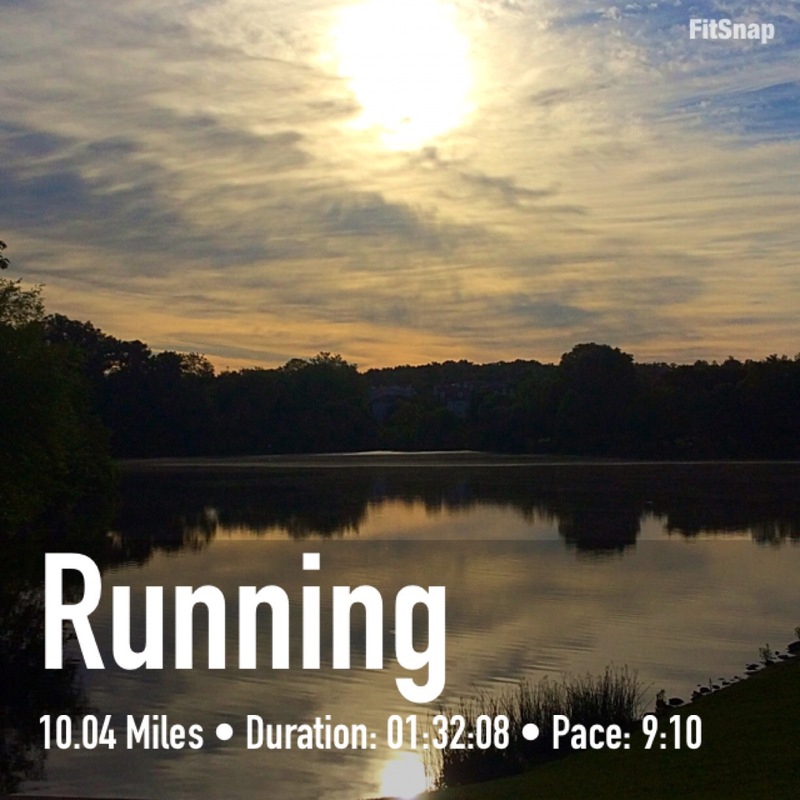 I ended up running 10 miles @ 9:10 pace. I felt surprisingly good and I might have been able to keep going but I needed to get home so my husband could go get the oil changed in his car. I think perhaps I should have worn gloves. The temperature said 50 but it felt much cooler to me which was fine except for my hands. The last few miles I was having a hard time using them because they were numb. The rest of the day was spent being productive by washing laundry. 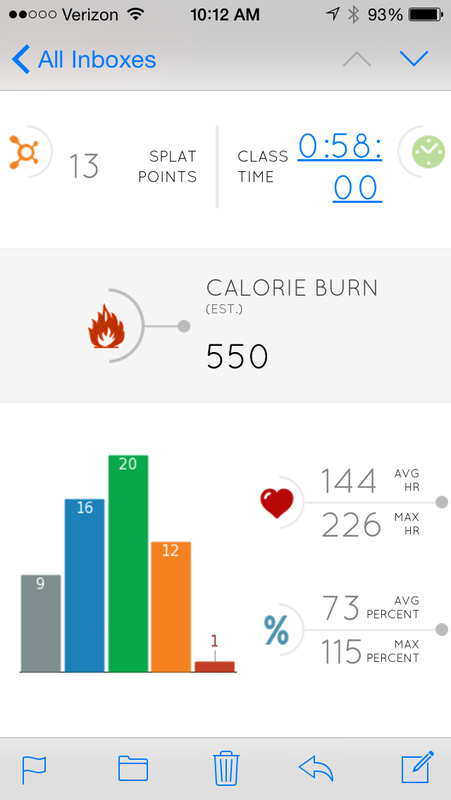 I went to OTF in the morning and got a pretty good calorie burn on. Then I went home and made a yummy breakfast smoothie. My husband got me a large box of mangoes from Sam’s club so I’ve been enjoying them in my smoothies lately. Later we went to my a 2nd birthday party for my friend’s daughter. Our girls are only about 3 months apart. It’s amazing watching them grow up so quickly. OTF in the morning. Then later we went to Toys “R” Us to pick up a water table for Haylie. She enjoyed playing with one the previous day at the party so we thought that it would be a good investment. We also had gift cards from her birthday party last year to use up, so it worked out perfectly. 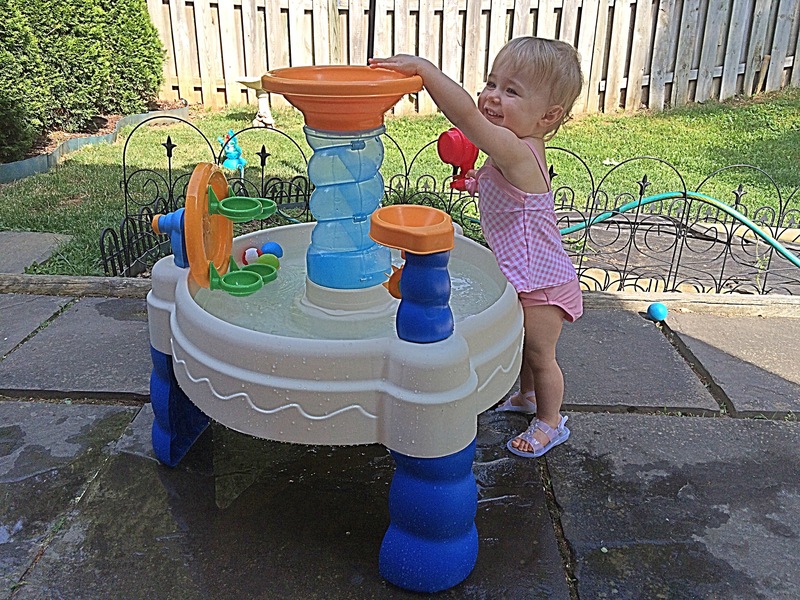 We ended up paying a whole dollar for the water table! My husband made us all a delicious dinner on the grill. Overall, it was a nice, relaxing weekend. Next week at this time we’ll be in Paris! Did you do anything fun this weekend? Do you have any exciting trips coming up this summer? It’s the Friday Five with: Cynthia, Mar, and Courtney today! Today’s topic is Five Favorite Summer Fruits/Veggies. I have so many favorite fruits and veggies that it is difficult to narrow it down to just five but I’ll try. 1. Avocado- I love avocado! There is so much that you can do with it. I love it plain with some salt and pepper. It’s amazing in guacamole! Avocado is also a nice way to change-up a sandwich or salad. 2. Passion Fruit- I love using passion fruit in desserts and I personally think that it pairs really well with mango. It’s also nice by itself or enjoyed in a beverage. 3. Sour cherries- I like all cherries really. The only thing that I don’t like about them, is having to pit large quantities of them for baking. After that was over, I used them to make a yummy breakfast bread though. They are great by themselves, in drinks, desserts, etc. 4. Watermelon- I don’t think any fruit screams summer as much as watermelon. It’s wonderful just as it is! 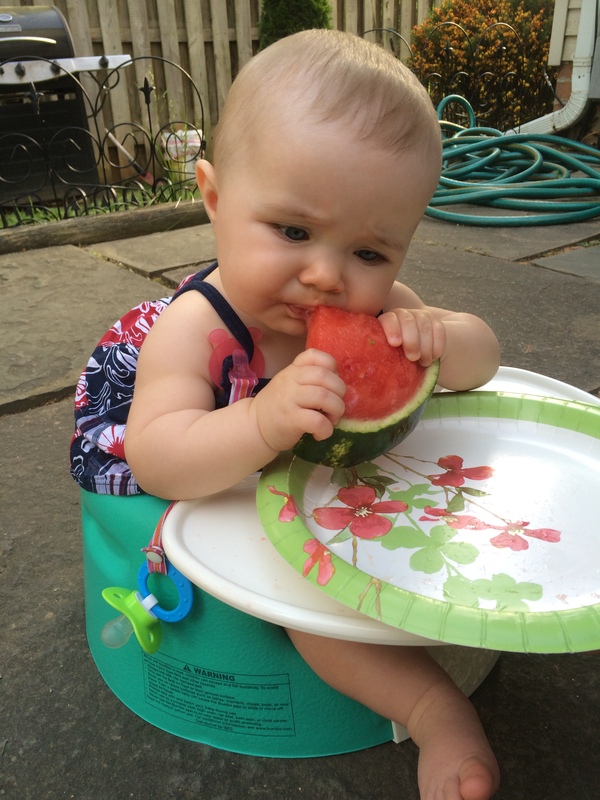 Haylie’s first watermelon. Crazy that this was a year ago already! 5. Peaches- They are so fresh and juicy! I love finding the prefect, ripe peach. Also great in pies! What’s your favorite summer fruit/veggie? 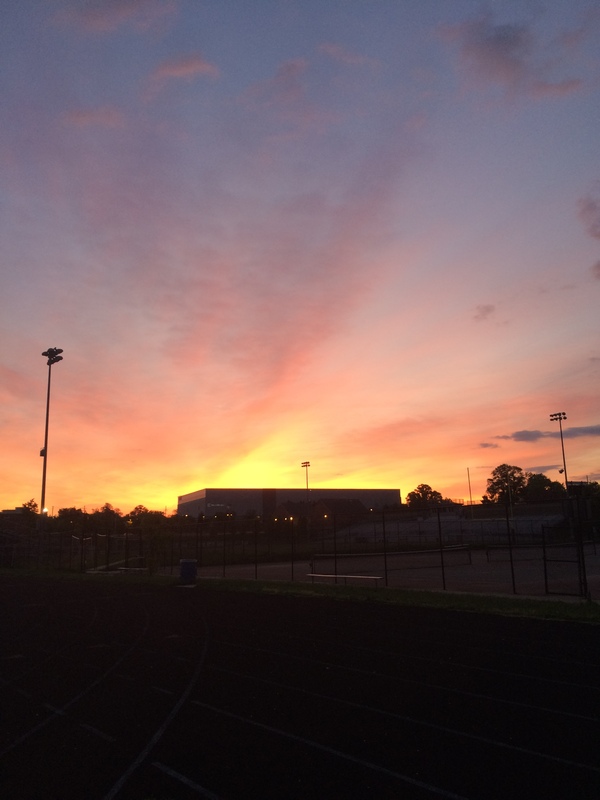 This past Wednesday, I did my very first track workout! I was so excited to meet some new people and incorporate a new workout into my routine. I’ve been wanting to do track work for a while now, as I’m sure it’s one of the best ways to get my speed up if I’m ever going to be able to BQ one day, but I didn’t know where to begin. I found out that the LUNA Chix do a track workout every week from Cynthia @ You Signed up for WHAT?! and thought that it would be the perfect opportunity for me. It was difficult but I loved it and hope to make it a regular part of my workout routine, as long as my job is alright with me being a little late on Wednesdays. I got to see an amazing sunrise which is a wonderful way to start the day and everyone was really friendly! It was nice to get my run in before work and also to beat the heat. I had a little bit of a runner’s high afterward which made the workday more pleasant and it also seemed to go by quickly. Our workout consisted of an 800m warm-up, 1600 at 5k pace, then 8: 400s followed by an 800m cool down. I was able to keep pretty consistent times and even picked up the pace a little on the last 400. 4 miles of track work completed before 7am! 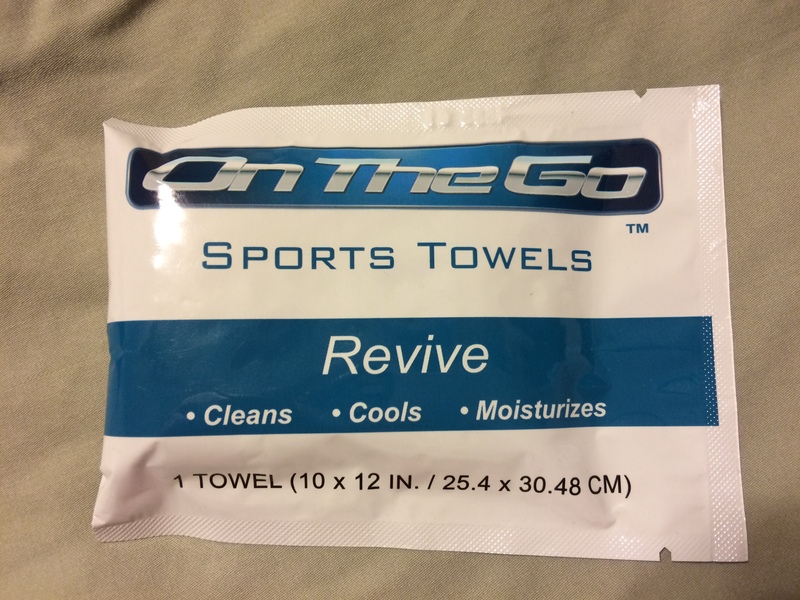 On the Go Sports Towels are amazing! I used these once I got to work since I knew that I wouldn’t have time for a shower. I was a little nervous since I’ve never worked out then gone anywhere without a shower but they worked really well. Other than my hair not being clean, I felt nice and refreshed. Bring on the day! Do you love track work? Have you tried these or other sports towels? It’s the Friday Five with: Cynthia, Mar, and Courtney today! Today’s topic is Five Ways to Organize your Running /Fitness Gear. Honestly, this topic made me laugh. I’m not sure that I should be the one telling you my organizing tips. I’m terrible at organizing right now! I can’t wait to see what advice everyone else has to offer! Here goes nothing…..
1. 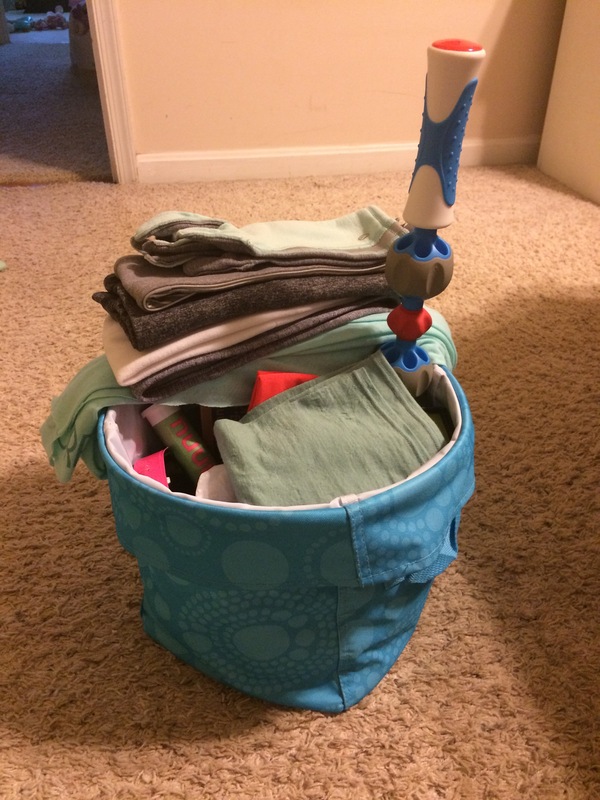 31 tote: This is my main form of organizing my running gear. All my accessories are tossed in this tote from 31 that my mom gave me. Although, without said tote I can only imagine the chaos that would take place. I have everything from hand warmers to Nuun to my roller in there. Sometimes I really have to dig for things. 2. Box of Fuel: Inside my tote, I try to keep a separate small box which contains all of my fuel: Gu, waffles, etc. That being said, I still find those things in other random places. I know that I have Gu hanging out in my bathroom right now. 3. “Gym Bag”: I have another small bag which doubles as my gym bag. It is actually a Lululemon shopping bag that I got last winter when I bought an ear warmer. Let’s be honest, that place is crazy expensive but they do have nice bags. Anyway, in this bag I keep my accessories that I use pretty much every run regardless of the season. This mostly includes my headphones, the case that I put my phone in when I’m running and a spare house/car key so that I don’t have to deal with my entire key ring. I like to keep these things separate so that they are easier to find. 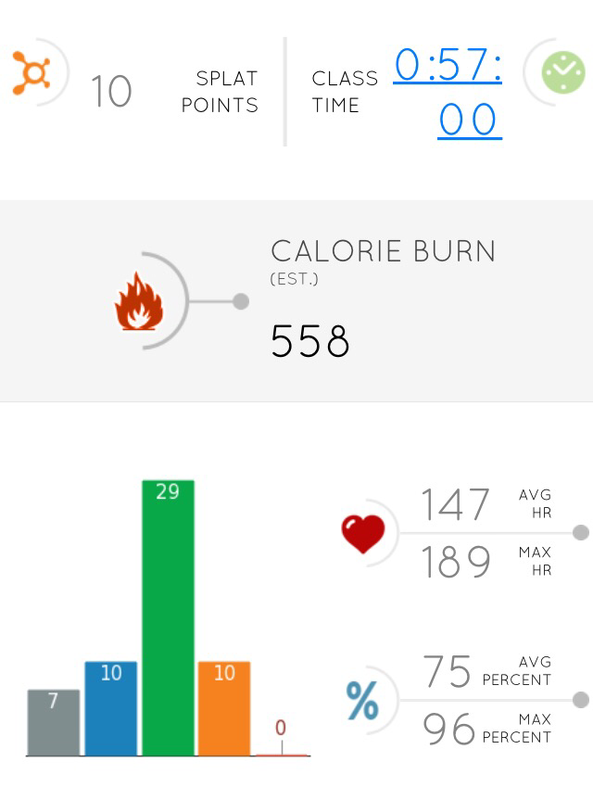 I also keep my heart rate monitor for Orange Theory and more Nuun in there. 4. Clothes: I’m not sure that I have an organization system in place for my clothes. I have way more workout clothes than normal clothes so they are everywhere. I like to hang my running jackets up in my closest but everything else is all over the place. I could at least put some seasonal organization into action. 5. Shoes: I do keep all of my running/workout shoes on a rack by my front door since they get used more than most of my other shoes. During the winter, I like to bring them upstairs the night before my long run so they can warm up (our basement is very cold in the winter). I’m a big wuss these days when it comes to the cold. Thankfully, I’m rid of that problem for the next few months! Sorry I’m not very helpful with organizational tips! How do you organize your running/fitness gear? It’s Monday, so I’m linking up with Tara for another edition of Weekend Update! This was truly an awful week. I won’t go into details as I don’t like to discuss my personal problems on the blog. “That which does not kill us, makes us stronger.” I really believe this to be true. I just have to keep reminding myself of that right now. Anyway, said awful week was followed by a really nice, and much-needed long weekend. 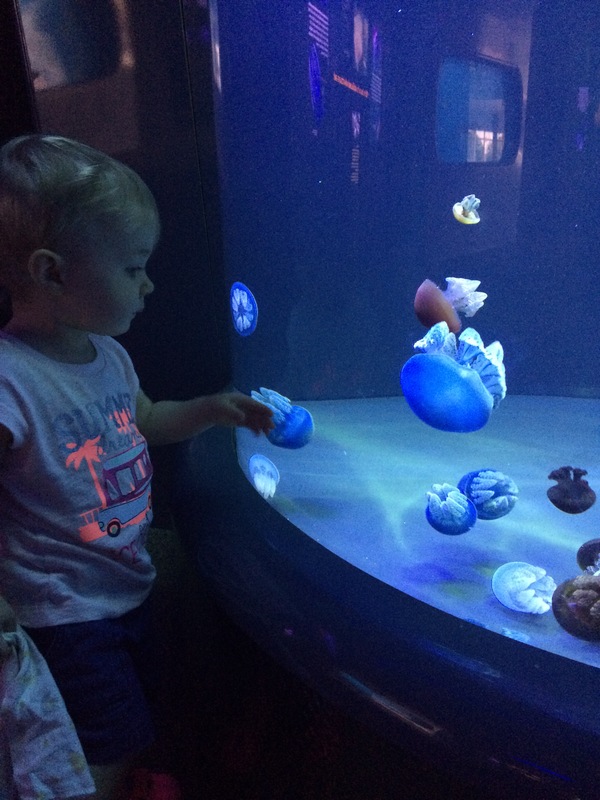 We went to the Baltimore Aquarium and got to check out the new exhibit, the Living Seashore. It was hectic due to a school field trip that was also going on, but we got touch a Clearnose skate and an Atlantic stingray. They felt pretty neat and Haylie seemed to enjoy it. She got a little cranky towards the end due to being tired, hungry and also fighting off a cold. So we went to have lunch at the Fresh Farms Cafe. I usually do my long runs on Saturday and Orange Theory on Sunday, but I had 2 classes to use up by the 11th so it was an OTF weekend for me. I like Saturday mornings with Ahmad anyway. He’s one of my favorite instructors and I always get a great workout in. Later we went to the Rio. 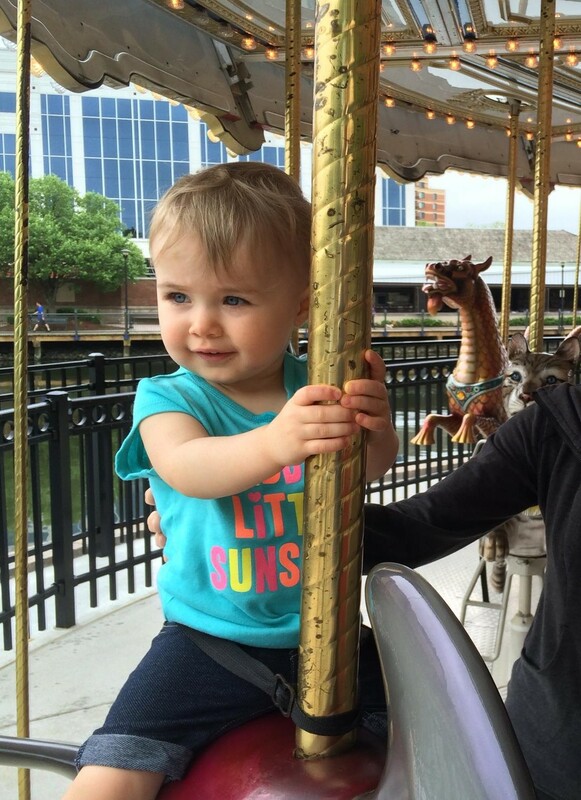 I really wanted to ride the carousel considering Haylie gets such a kick out of it. Since we were just at the aquarium, I put her on a dolphin. We picked up a few necessities at Target, including a new sun hat for Haylie. Then we made a quick stop at Starbucks. I haven’t had a coffee in a long time and I have to say it was pretty tasty! 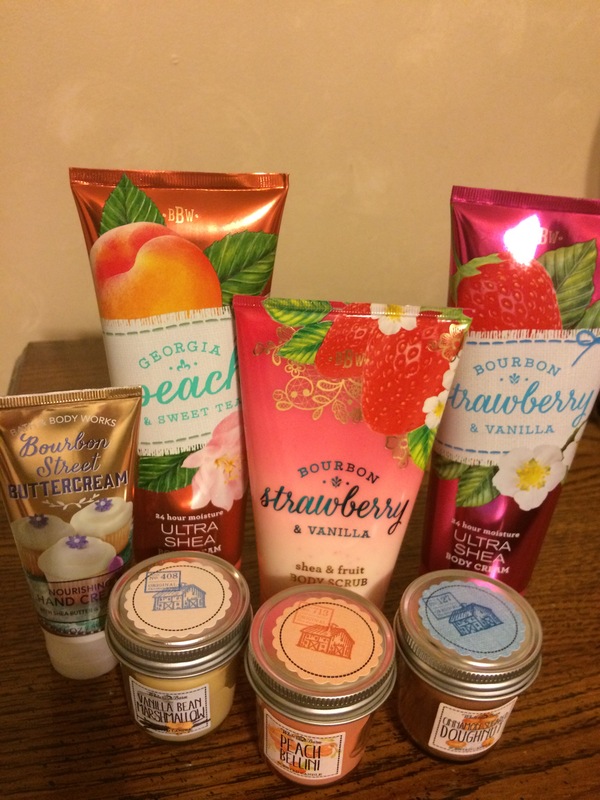 Our last stop was at Bath & Body Works. I couldn’t remember the last time I stepped foot in that store so I was due. I probably won’t go back again until Fall. That’s when I really stock up and get all of my favorite fragrances. I do love their sales and coupons! OTF in the morning. Then it was pretty much business as usual, after a fun-filled Friday and Saturday. I so wish that laundry could wash and put itself away. That would be amazing! Did you have a great Mother’s Day? It’s the Friday Five with: Cynthia, Mar, and Courtney today! 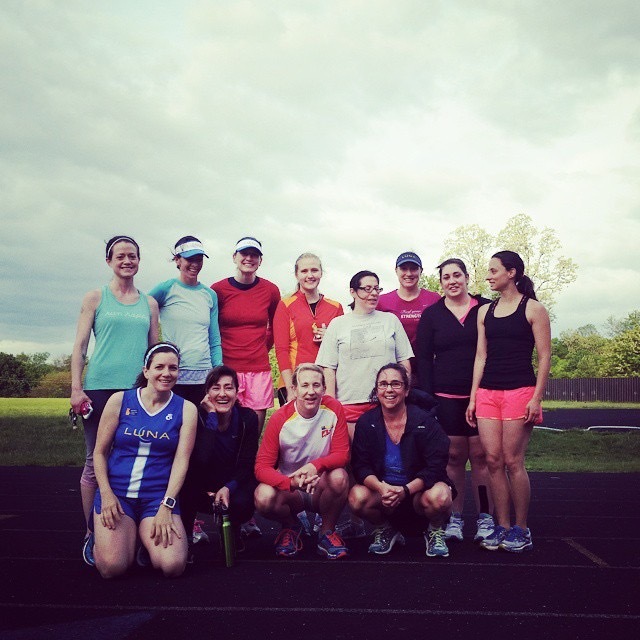 Today’s topic Five Ways to Share the Running / Fitness Love. 1. Blog – Blogging is a fun way to spread my love of running around the world. It’s also nice to meet people who are more local that I might actually meet one day in person. I love to read other people’s blogs and keep up with what is going on in the running world. 2. Getting Kids Involved – My daughter isn’t quite there yet, but once she’s older I would love to get her involved in running if that’s something that interests her. Right now she certainly loves running laps around our living room and yard outside. I like to run while pushing her in the stroller but it’s difficult right now since she really wants to get out and run around on her own. She’s getting pretty heavy to push too. I don’t know how some people do it with much older children than mine or more than one! That amazes me! 3. 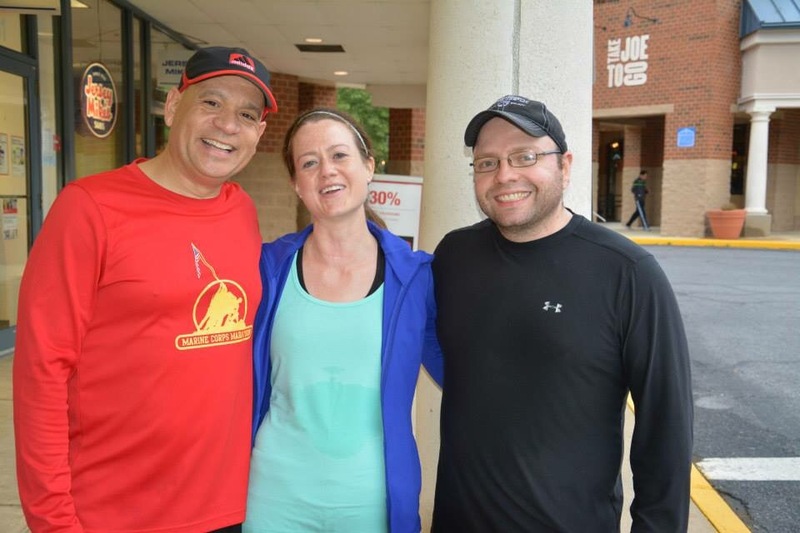 Getting Friends Involved – It’s nice to find friends to run or race with. My husband and I did the color run with a friend of mine and her husband back when I was pregnant. It was fun and I didn’t care about the time that it took at all. 4. 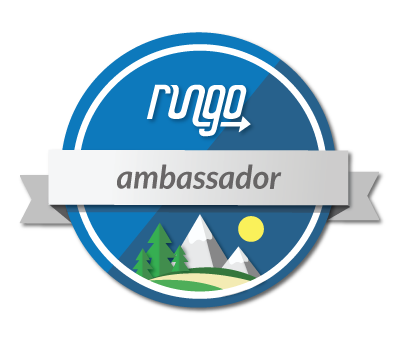 Join a Group – I joined MRTT over a year ago and it’s been great! There’s a nice variety of runners, from more experienced to some who are just beginning their running journey. 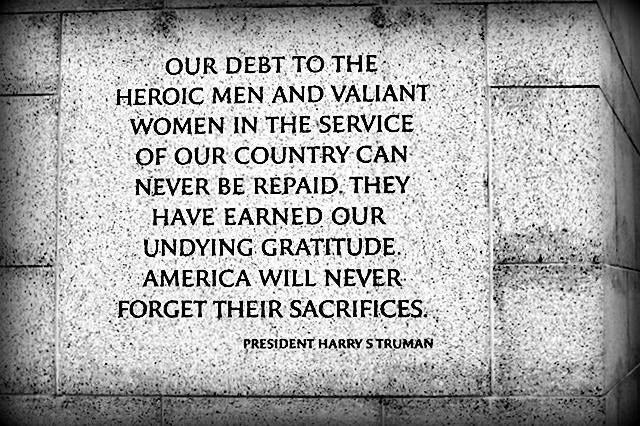 It’s nice to hear their stories and we encourage one another along the way. I met some wonderful and inspiring women there. 5. Volunteer – This is something that I’ve actually done yet. I’ve been tossing around the idea but it’s hard to find free time, especially with my daughter being so young. If I do find the time though, I would love to be a coach for Girls on the Run. It sounds like such a great program to teach girls about self-respect and healthy living. You can also volunteer at a race and be supportive of other runners. I did this once with my mom when I was in college, and should do more often. How do you share the Running/Fitness love?